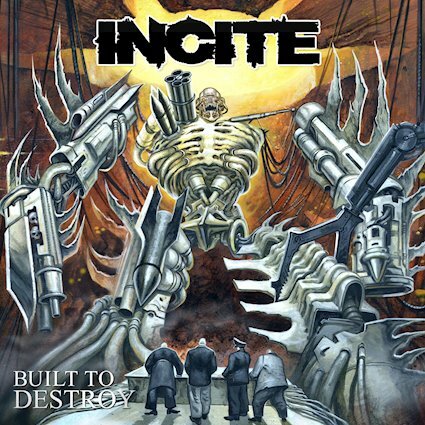 Long time road warriors and groove metal masters, Incite are back with their first record in three years. The road has not always been kind to these weathered veterans, but now with ll sorts of tours lined up and an appearance scheduled at Bloodstock Open Air it feels like fifteen years in the band might be getting somewhere. Obviously I'm biased, I toured with Incite a few years ago and connected with the guys - but all that aside, this is a really potent release and one that I think shows massive growth for a band whose lineup is finally stabilizing. Operating in the same sphere of groove metal as acts like Devildriver and Lamb of God, Built To Destroy sees the band really doubling down on their unique brand of crushing riffage. The colossal bottom end brought by El (That's just his name, don't question it) is a special highlight, giving massive breadth to some of these songs. The band punches forward wonderfully aggressively with every crashing note, and the guitar playing has seemingly reached bold new heights. This is a band who have pushed every aspect of their sound to the limit here and proven that they still haven't reached their full potential. Going above and beyond many of their peers in the space, Incite have created something over the top and fun. With their trademark brutal assault and throbbing grooves, Built To Destroy is an addictive listen and one that seems to be a git that keeps on giving. The percussive vocals of Richie Cavalera give the entire thing a whole new sense of form, layering on another dimension to the music and speaking to the intensity of what has been delivered here. This is a fun listen and it's one that dedicated metalheads are going to love getting to jam time and time again. It's a metal record for metalheads, and if you want fat groove metal riffs crashing around your skull all day, look no further.